A new structure of a quasiprobable measurer of repetition period of pulses against the white noise background is suggested. The loss in accuracy of quasiprobable estimation, in compared with the accuracy of maximum likelihood estimation, is determined for regular and discontinuous pulses. KULIKOV, Ye.I. ; TRIFONOV, A.P. Parameter Estimation of Signals against Interference Background [in Russian]. Moscow: Sov. Radio, 1978. SOSULIN, Yu.G. Theoretical Foundations of Radiolocation and Navigation [in Russian]. Moscow: Radio i Svyaz’, 1992. LYOZIN, Yu.S. 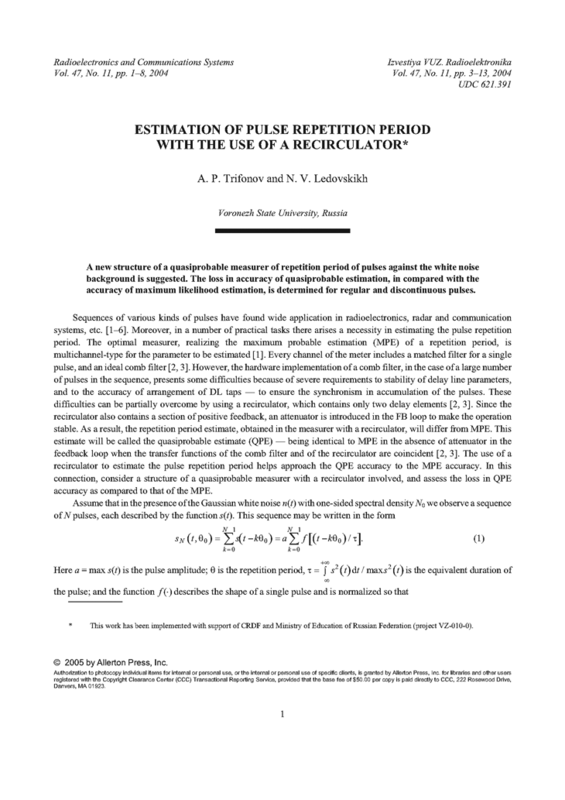 Optimal Filters and Accumulators of Pulse Signals [in Russian]. Moscow: Sov. Radio, 1969. TRIFONOV, A.P. ; SHINAKOV, Yu.S. Simultaneous Discrimination of Signals and Estimation of Their Parameters [in Russian]. Moscow: Radio i Svyaz’, 1986. BESPALOVA, M.B. "Potentcialnaia tochnost ocenki perioda sledovaniia videoimpulsov pri nalichii neinformativnykh parametrov," Izv. VUZ. Radioelektronika, v.42, n.9, p.19-27, 1999. TRIFONOV, A.P. ; BESPALOVA, M.B. "Harakteristiki ocenok vremennogo polozheniia i perioda sledovaniia razryvnykh impulsov pri nalichii neinformativnykh parametrov," Radiotekhnika i Elektronika, v.41, n.10, p.1215-1221, 1996.